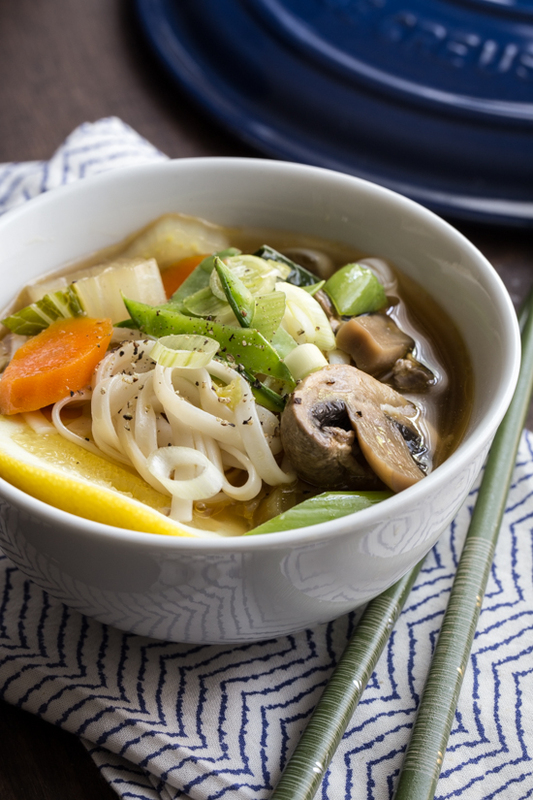 Asian Vegetable Noodle Soup is a light, meatless meal full of fresh ginger and lovely spring vegetables. 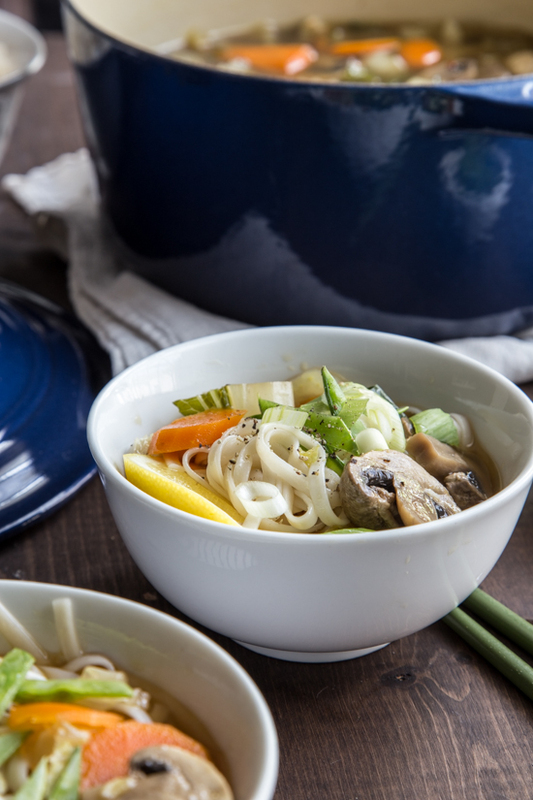 Soba noodles tossed in sesame oil complete this simple weeknight soup. Disclosure: This post is sponsored by Le Creuset and Williams Sonoma. As always, all opinions are 100% my own. When Spring rolls around, the meals in our house become inherently lighter. Healthier. I get the urge for food that won’t weigh me down, but will still be satisfying. While we aren’t vegetarians, our dinners tend to be meatless about 50% of the time. And with the influx of stunning Spring vegetables, it’s hard to resist pushing them to the forefront of our menus. A while back, I was contacted by Le Creuset and Williams Sonoma about participating in a pot luck featuring their new Lapis French Oven. The #LapisPotluck has been such a wonderful experience. I received the gorgeous deep blue Lapis oven in a fun, bright orange traveling case. Let me just say, this oven travels in style. The purpose of the Pass it on Potluck is to create a family meal to share and document and then pass the lovely oven on to the next family for them to enjoy. 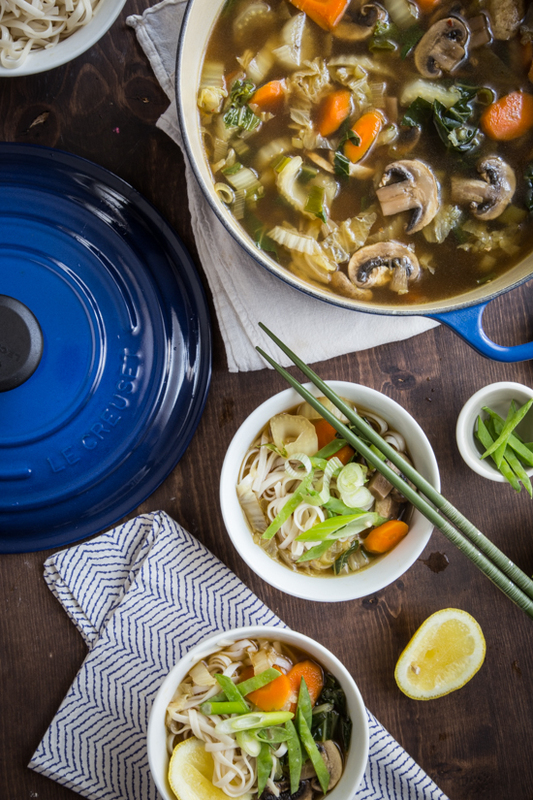 I thought for a long time about what I wanted to create in the Lapis oven and ultimately decided on an old family favorite: Asian Vegetable Noodle Soup. It’s a recipe that I came across a while back from Food and Wine and have made and tweaked to fit our family’s taste. It’s full of fresh vegetables like scallions, carrots, cabbage and my kiddos favorite, mushrooms. I love how hearty this soup feels, but it’s incredibly healthy at the same time. In addition to being delicious, the soup is incredibly quick and easy to make. Chopping vegetables is the most time consuming step. But I love chopping veggies (I’m funny like that) so I find it therapeutic to stand at the cutting board chopping away. The Lapis oven was wonderful to work with. It’s lovely and this 5 1/2 quart size was the perfect size for our family of four. I was a little sad to see it go, but I’m looking forward to checking out it’s journey as it travels on to the next family. Take a look at the Pass it On Potluck to learn more about this exciting traveling oven! Heat 5 1/2 quart French oven over medium high heat and add cooking oil. Add scallions, garlic and ginger and sautee for 1-2 minutes, stirring constantly. Pour in vegetable broth and water. Stir. Turn up heat and bring to a boil. Reduce heat to medium low. Add carrots, mushrooms, nappa cabbage, soy sauce and crushed red pepper flakes. Stir and simmer until carrots are starting to become tender, about 5 minutes. Stir in bok choy and cook until tender about 5 more minutes. In a separate sauce pan, cook noodles according to the package directions. Drain and toss with sesame oil and set aside. Season soup with salt and pepper to taste. Divide noodles among bowls and top with the hot soup. Garnish with scallions, snow peas and a wedge of lemon (see notes). Enjoy! Garnish soup with sliced scallions, sliced snow peas and a lemon wedge.